I just wanted to post an update on my problem with Penguin Adventure crashing. The game crashed every time on both of my unmodded systems using the 2nd run SGM, but I tried it with a 3rd run SGM and it worked most of the time, only crashing every once in a while. I should mention that I was consistently having a problem booting a few original games like Congo Bongo and Subroc, but those would always start after resetting the power switch. I sent my console to Yurkie for a no mod refurbishing and now Penguin Adventure and all of the other games start perfectly. He didn't change any components, just his world famous console refurbishing, plus he fixed two controllers that were barely working anymore and now work like new! Anyway, I don't know if it was a seriously dirty cart slot or some chips or solder that were loose or cracked, but Todd worked his magic on the console and now it's playing nice with all of my games. I believe I now know what the source of the Penguin Adventure resetting problem is and how to fix it. More info here. Edited by Ikrananka, Fri Feb 8, 2019 12:10 PM. I have a SGM from the 3rd run and it was working like a charm until today. Now it lights up but none of my games are recognizing it Cleaned the pins on my expansion ports of both my machines and still nothing. I kinda expected that as my machines are clean. I even cleaned the pins on the SGM just to be able to check that off the list of options. Anyone else ever experience this? If so is there a quick fix so I can get back to playing my SGM games? I've messaged Opcode to see what he thinks but I know he's a busy fella all the time. I'm sure you didn't remove it or insert it with the coleco powered on? No I didn't do that. I had it put back in the box and today I brought it back out, plugged it in, powered up my coleco and it didn't work. It's very puzzling to me. EDIT: Are you saying you have a solution to fix such a scenario? If so you should post your fix in case others who find themselves in that boat can do something about it. No, no fix. It's just the only thing I can think of that would spontaneously make it not work possibly. Lots of static this time of year too. If it doesn't work on 2 machines though and they both can play regular games and use the expansion port for other things like the 2600 adapter....it sure sounds like the sgm crapped out then. You have used more than 1 psu? A psu that is going bad might not provide adequate power for the sgm to function? I have a couple power supplies and both are working well. I did a quick teardown to see if it was anything else obvious and I found out what is wrong with it. The VIA's threw the PCB have broken from insertion. This should not be possible. 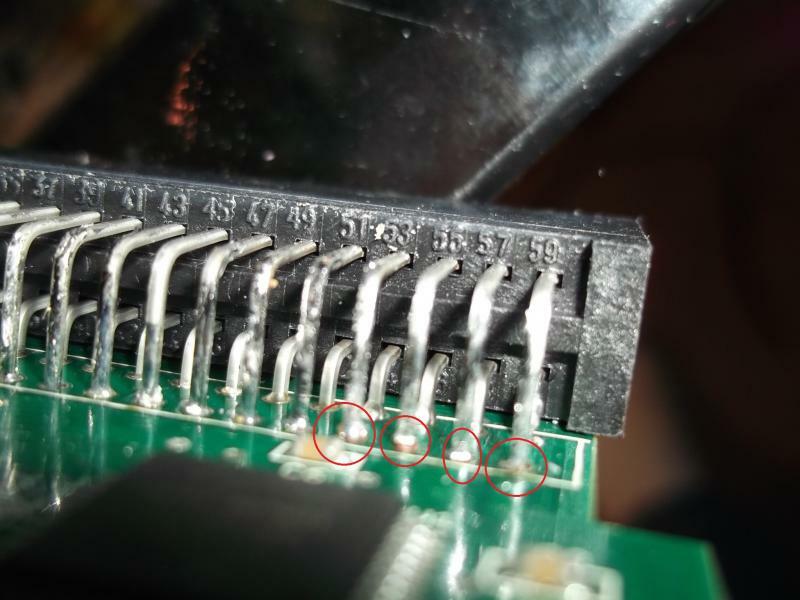 I reflowed the pins hoping for some chance of help and nothing. I'm guessing the traces might be snapped as well. I"m too pissed off right now to look any further. This exact situation should be impossible but here I am. I hope Eduardo can catch wind of this issue so anything like this for future runs of an sgm or 2 can be fixed so this doesn't happen ? I'm just hoping he has some extra blank pcbs so the brains of my SGM can be transplanted. I have always been kinda worried about taking it in and out so have just left mine inserted. Hope he can help you out. I'm sure he will but it all takes time away from enjoying it. I just talked to Ed's wife Gracie and they are replacing it for me. Now that is top notch! That's great news! Great customer service!